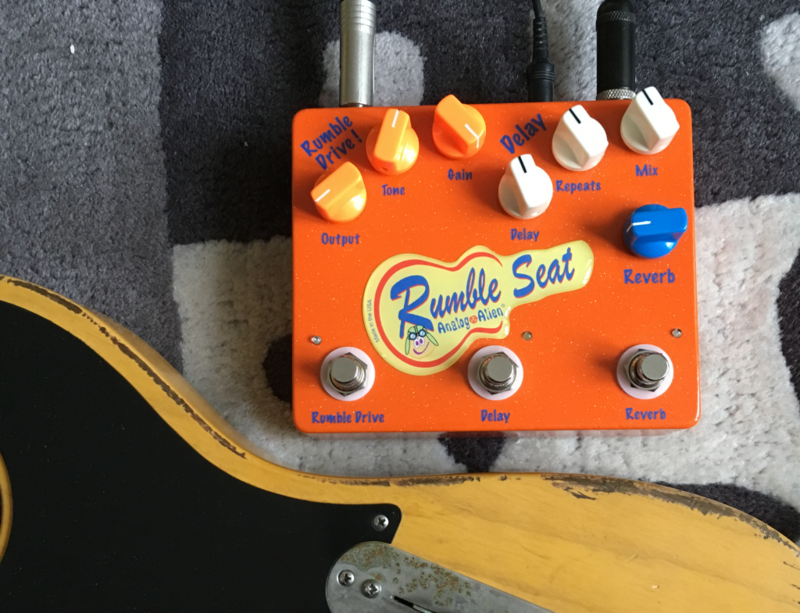 Pedal Review – Rumble Seat from Analog Alien: overdrive/delay/reverb in 1 unit! Analog Alien (www.analogalien.com) is an American brand of boutique pedal that offers a range of products with a very original look and a beautiful palette of sounds. The Rumble Seat that The Guitar Channel offers you to discover below is a 3-in-1 since this pedal offers you an overdrive, a delay and a reverb in a compact format. In a very compact format, the Rumble Seat offers you a complete kit that can very well play the role of a complete pedalboard. Everything is here! The overdrive sounds great with a nice variety of sounds. The analog delay is perfect. The reverb can become very present as soon as you increase a little the pot nevertheless it gives an excellent result. The acid colors of the look are not necessarily for everyone but at least the pedal will have impact on your pedalboard. Go Backstage to access the private community and all the videos.